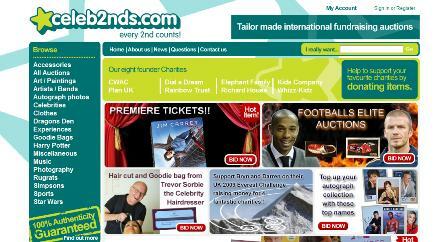 What was the thinking behind launching Celeb2nds? I saw a potential gap in the market for a niche celebrity but charity based auction site. My belief is that charity auction sites do not really work because people are scared off by the word charity, but dress up a charity based fundraising auction site with a celebrity facade and you have a winning formula. After doing two years of thorough research on the idea and after lots of meetings with agents, charities and publicists and working with lots of charities via my media company Madison Bell Media I received nothing but praise for the idea so I had to give it a go. Why choose an auction site? Lots of charities were also telling me that they had nowhere to market their celebrity items and experiences other than auction them at their events, so a daily auction site seemed to fit the gap. How have you been promoting Celeb2nds? I’ve been promoting it through my eight founder charities, using a PR company, blogging on specific websites and forums, traditional print media, e-newsletters. We’ve raised over £5,000 for good causes so far, but we have only just launched two months ago, and are picking up some amazing celebrity items for auction. Do you have much of a budget for promoting and running the website? My budget is very small as I am the only investor, but I am in the process of looking for sponsors and advertisers as every item and experience donated could potentially be sponsored by a brand that’s related to the specific item or experience that celebrities or charities are auctioning. I also have the facility to do affiliate marketing on the site that I have yet to explore. It would be nice to find a way of reaching more of an audience but it is expensive to advertise or use a PR company. Have you had a good response from celebrities so far? guarded by their agents and publicists, which is to be expected. The celebrities that have donated directly are really pleased that we not only work for the bigger charities but are also helping those smaller charities fundraising efforts. What has been the most popular item you’ve auctioned so far? The most popular item so far was Duran Duran’s original drum kit, it went to a guy in Canada in the end. Kelly Osbourne’s dress also attracted lots of interest while Cliff Richard’s Tennis Foundation jacket is causing a bidding war at the moment! How much thought did you give to usability when designing it? It was all about being user friendly. I am a graphic designer by trade, so I wanted the colours and the look and feel to be perfect and I think my web developers achieved that. It’s easy on the eye, and is very easy to navigate. I do all of the back end work, marketing, blogging and designing myself to keep the costs and overheads down. This way I am able to give a higher percentage of 90% back to the charities. I wont be taking on any staff yet because obviously I want to give the maximum that I can back to the charities. 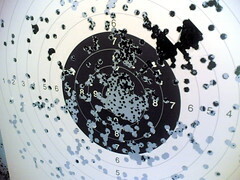 Is behavioral targeting breaking online publishers’ business model? The recession is hitting publishers hard. This is true online and offline as advertisers aren’t limiting what gets put on the chopping block. Many believe that the trackability and accountability will keep online publishers in good stead and despite declining online ad spend, it’s easy as an online publisher to look at the woes of the newspaper industry and feel pretty confident about the future. Google plans to fight the $1bn lawsuit brought against it by Viacom over the alleged use of copyrighted content on YouTube. The lawsuit, filed by Viacom in March this year, accused YouTube/Google of ‘massive intentional copyright infringement’ due to the number of Viacom’s clips which had been uploaded to the video site.